A couple of days ago the rest of the HSF14 challenges were posted and here they are, my comments are in italics after the challenge. #8: UFOs & PHDs – due Thur 1 May. Use this opportunity to finish off something that’s never quite gotten done, or stalled halfway through. Check out the post from last year for more information on how to interpret this challenge. It might seem strange but I don't have any UFOs or PHDs, since I'm only working on one project at a time I finish them before moving on. This might have changed when we get into May though. #10: Art – due Sun 1 June. Make your own masterpiece based on a work of art. Of course if a fashion plate can be seen as art, then I can probably to the accessories for the gown here, I'm thinking the gauntlets and those things hanging from the vest. #11: The Politics of Fashion – due Sun 15 June. World affairs have both affected, and been affected by, fashions. Craft something that demonstrates the interactions between dress and political history. This would be the final reveal of the whole 1787 revolutionary. #12: Shape & Support – due Tue 1 July. Make a garment that changes the silhouette of the human form through shaping and support. I will probably take a break here. #13: Under $10 – due Tue 14 July. Whip up a fabulous item for under $10 (we’ll use US$ as the de-facto standard) I'm looking forward to finding something in my stash and use it for this challenge. #14: Paisley & Plaid – due Fri 1 August. Plaid is the most universal pattern, found in the textiles of almost all cultures and periods. Paisley is more unique and recent, but has had a lasting impact on design. Make something that utilises one or both of these patterns. I'm not a fan of either paisley or plaid so I'm skipping this one. #16: Terminology – due Mon 1 September. 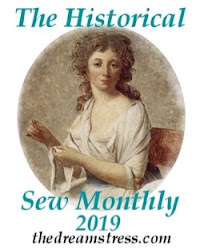 Explore the etymology of fashion by make something defined in the Great Historical Fashion & Textile Glossary (new terminology posts and items will be added throughout the year). No idea, but I guess I'll go through the glossary and see if I find something. #17: Yellow - due Mon 15 September. Embrace the sunny side with something in any shade of yellow. Not a fan of yellow, but I have that really nice yellow wool I bought in London. #19: HSF Inspiration - due Wed 15 October. One of the best things about the HSF is seeing what everyone else creates, and using it to spark your own creativity. Be inspired by one of the challengers item from HSF ’13 or HSF challenges 1-18 to make your own fabulous item. I'll have to wait and see if I get some inspiration. #20: Alternative Universe – due Sat 1 November. Create a garment from an alternative universe: fantasy, steampunk, dieselpunk, etc. Your item can be perfectly historically accurate within our own universe as well. Considering I'm in for making SW costumes I can probably get something to fit here. #22: Fort-nightliers Choice – due Mon 1 December. This one is up to you! In June I’ll ask for suggestions for a theme, and we’ll vote to pick the one you most want to do as our 22nd Challenge of the year. Of course I can't decide until I know what the challenge will be. #23: Modern History – due Mon 15 December. Make something historical or historically inspired that is wearable in an everyday context. Here I think I already know what I want to make. I really like the mittens from Costume Close Up, and I use similar kind of mittens anyway so they wouldn't look out of place in my wardrobe. I have a lot less ideas for the challenges of the second half of the year, but that's because my main historical costume is supposed to be done by that and I haven't decided on any other historical projects. 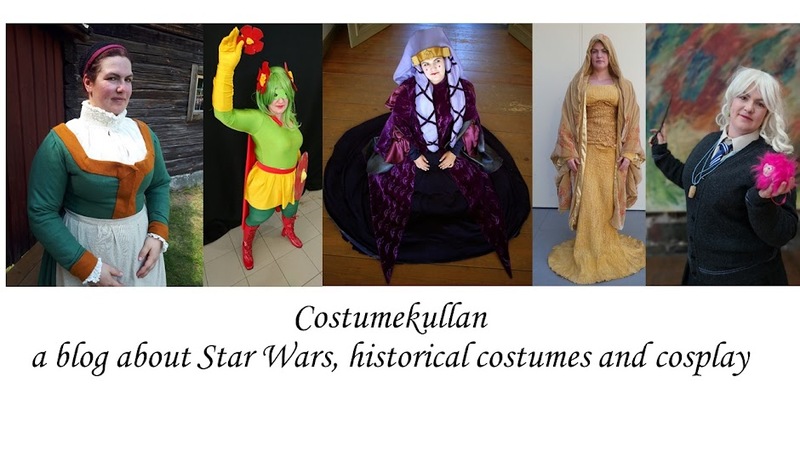 I also have a couple of SW costumes to finish in that period so I'm not sure how much historical costuming I'm going to do. On the other hand these challenges may convince me to keep going with historical costumes until the end of the year.